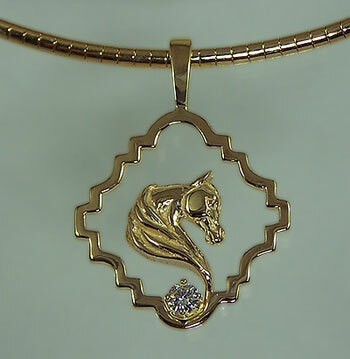 "Arabian Horse Head Diamond Pendant"
Arabian Horse Head in Frame set with Diamond. The Gorgeous Horse, your destination for custom Arabian jewelry. Here we have a classic Arabian Horse Head design but see how it's virtually suspended in a uniquely designed frame, completed with a quarter carat diamond! The width of the frame will help your pendant lay flat and centered nicely for all those to see. Use our comments box below if you would like to change the type of stone or make any further alterations! Dimensions: 1 1/8th inches wide x 1 1/8 inches tall. Available in 14kt yellow or white gold. Set with .24ct VVS I-color diamond.